Tonight I played hooky from our "Wednesday Night Live" evening at church. I haven't been going to the suppers for a number of weeks because they are "traditional American" fare, loaded with animal-based protein and refined carbs. But I have been arriving in time for the Chronological Bible Study. But tonight I stayed home entirely, because I am still catching up from the busy weekend. That meant I went foraging in the fridge/freezer for supper. 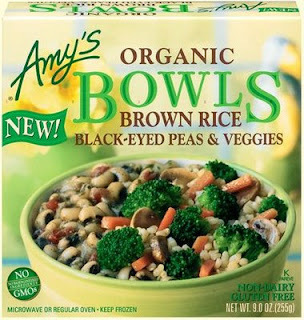 I found an edition of Amy's Bowls in the freezer, this one "made with organic black-eyed peas, vegetables and [brown] rice." The veggies included broccoli, carrots, mushrooms, onions, extra virgin olie oil, tamari (wheat free), cilantro, ginger, sea salt, garlic, spices, all "organic" except for the salt. The plastic bowl full of this stuff is covered by some sort of transparent wrap. One is to cut a one-inch slit in the wrap and put it in the microwave on "high" for five minutes. I must say it did not look that exciting, but I proceeded nevertheless. It was really good! I made some whole wheat toast to go with it and had a banana and an apple for dessert. I recommend Amy's Bowls, if this is an example of what all of the various types are.